Let’s share pictures of the four quilts we previewed at our Annual General Meeting in April 2019. These, and many more, will be up for auction this September. To keep you in high suspense, let’s just call them “Quilt 1” through “Quilt 4”. Remember to join us in September at Black Creek Pioneer Village in Toronto. As we began to store the quilts for the quilt auction, held at high noon on Saturday September 15, 2018, we previewed some of them here. The first quilt is a printed “Double Wedding Ring”, measuring 88″ x 104″. 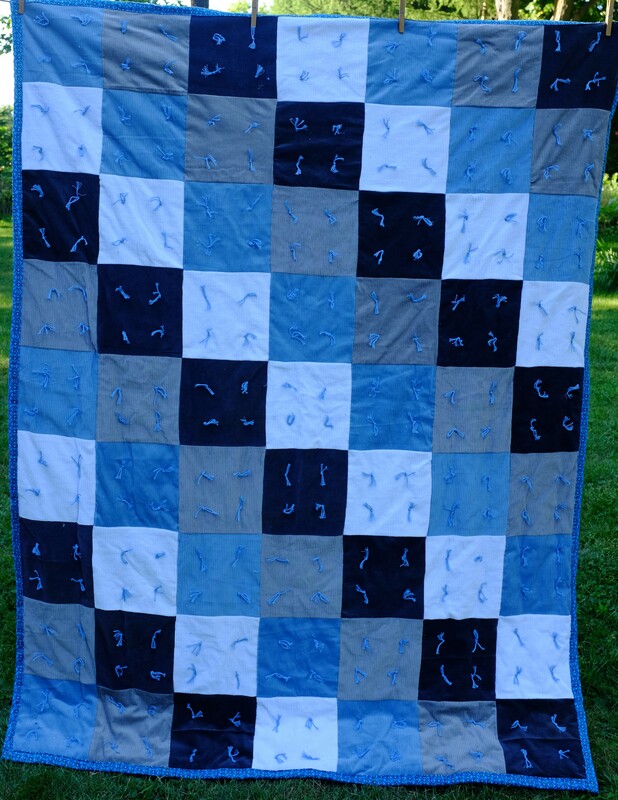 Our second is a pieced 32″ x 42″ crib quilt, “Blue Ducks”. The third is a full-size “Star” printed panel; 85″ x 102″ in size. 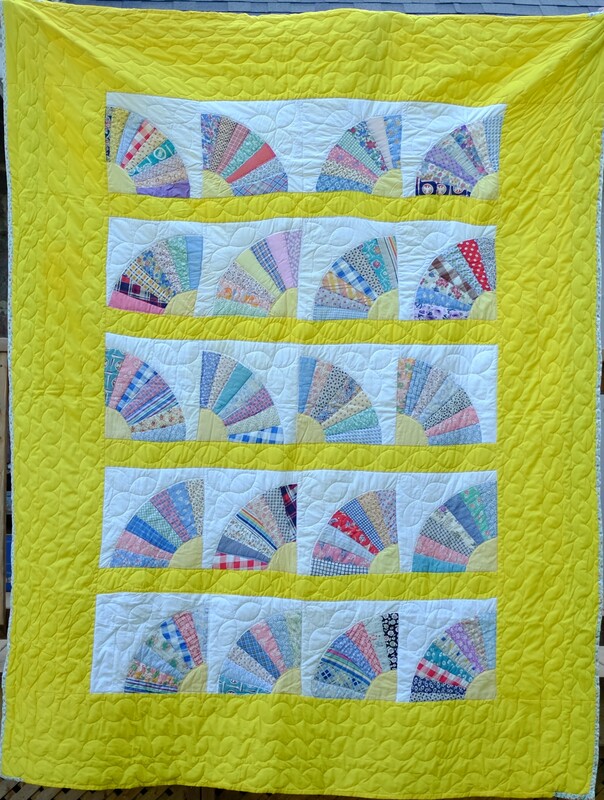 Quilt #4 is a used, pieced “Fan” quilt. It’s up for auction AS IS. It measures 72″ x 82″. 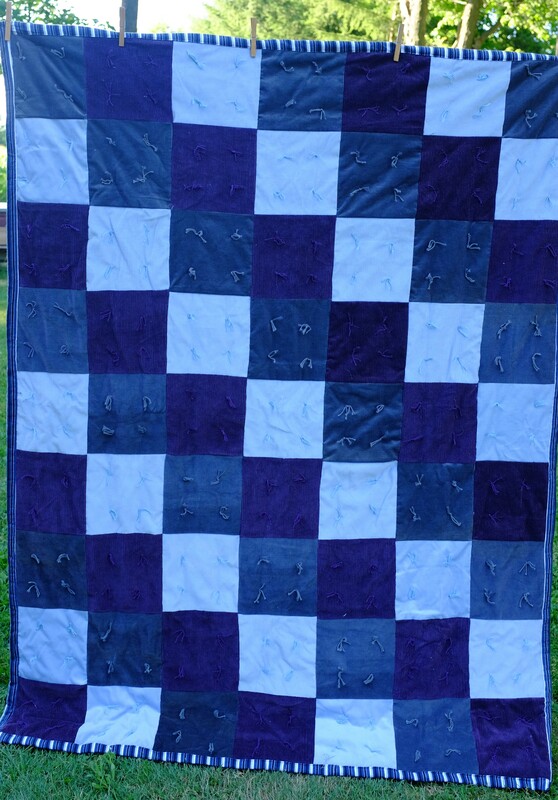 Our fifth item is a large, blue or purple, pieced “Spin Star” quilt. It’s 99″ x 110″. Quilt number six is a tan and brown and blue pieced “Window Boxes” pattern, measuring 78″ x 93″. Next we have a group of tied corduroy comforters. The first, in brown, gold, and cherry, measures 62″ x 80″. This comforter is brown and rust coloured; 64″ x 80″. The next comforter is 68″ x 82″, and multi-coloured. Our next tied corduroy comforter is 62″ x 78″, in red and blue. The back is hockey flannel. This 62″ x 80″ tied corduroy comforter is 62″ x 80″, in red, gold, and brown. “Streak of Lightning” is a tied corduroy comforter in blues and grays. It measures 66″ x 80″, and is my personal favourite in this group of comforters. Item 13 is another tied corduroy comforter in black, brown, and “leaves”. Size: 62″ x 80″. 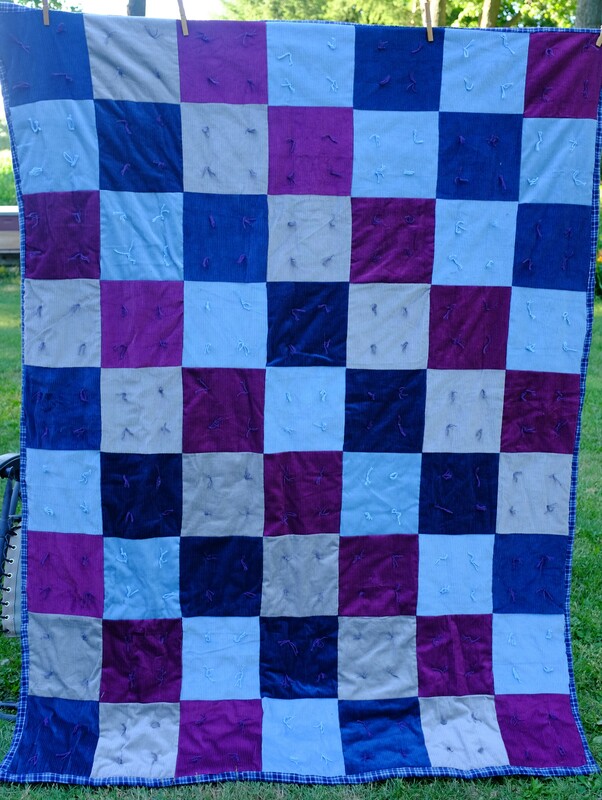 Quilt #14 is a tied corduroy comforter in gray and purple; size 62″ x 80″. Number 15 is another tied corduroy comforter. It’s 60″ x 80″. The front is grey and blue; it has a striped back. The final tied corduroy comforter (in this streak!) is a multicoloured cotton; 62″ x 74″. 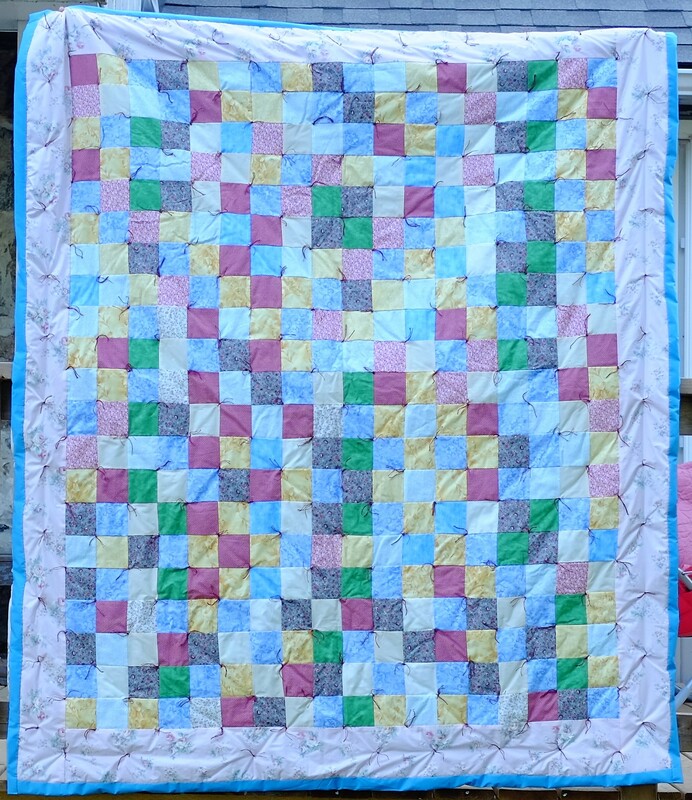 Next we have another used, diamond-pieced, multi-colour quilt. It measures 78″ x 80″. Like our other quilts, it is available “as is”. Quilt #18 was also pre-owned, and is auctioned “as is”. 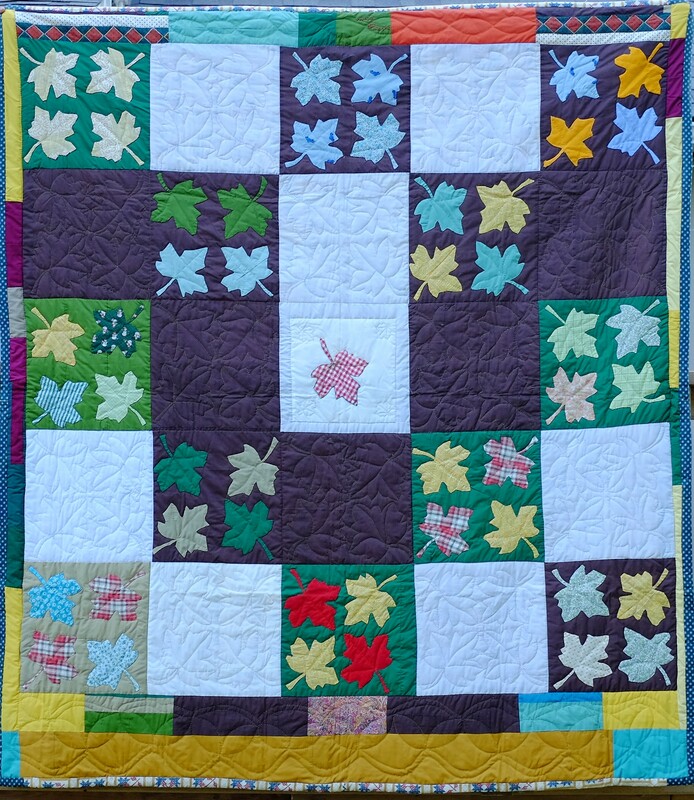 It’s an appliqued quilt with maple leaves, measuring 76″ x 84″. Here is a pair of whole cloth quilts, both measure 62” x 94”. These vintage quilts were made in the mid-1950’s in Orillia Township, in Simcoe County. Both quilts have been gently used and are in good shape. Buyer will have the choice of taking one or both. The second picture shows the center quilting design. Again, please note these are used are up for auction AS IS. Detail of the quilting on one of the vintage whole-cloth quilts. Used and as-is. That’s it for the “used quilts” section. We’re starting a group of crib quilts, but #19 is large for this category: 60″ x 70″. 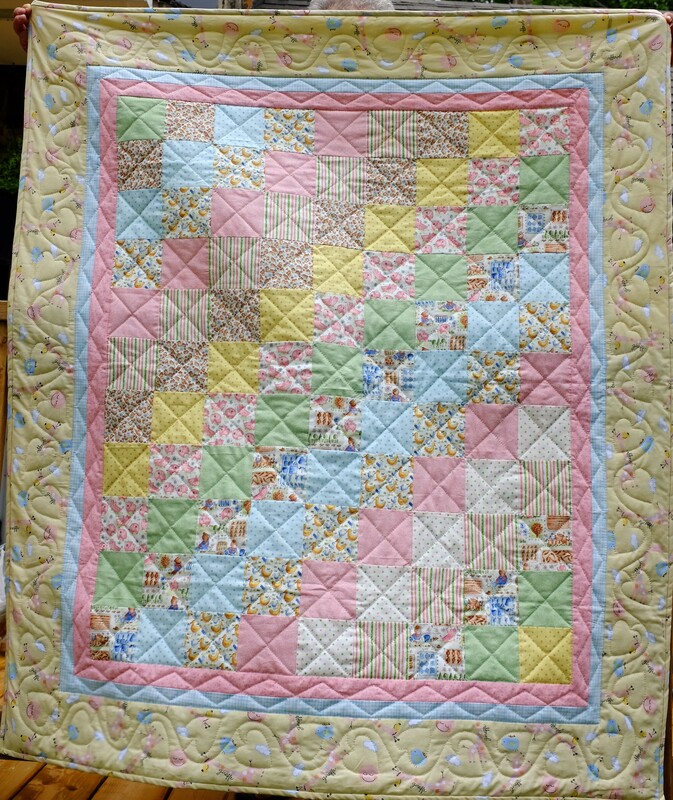 This large crib quilt is a “Sweet Petunia” design. 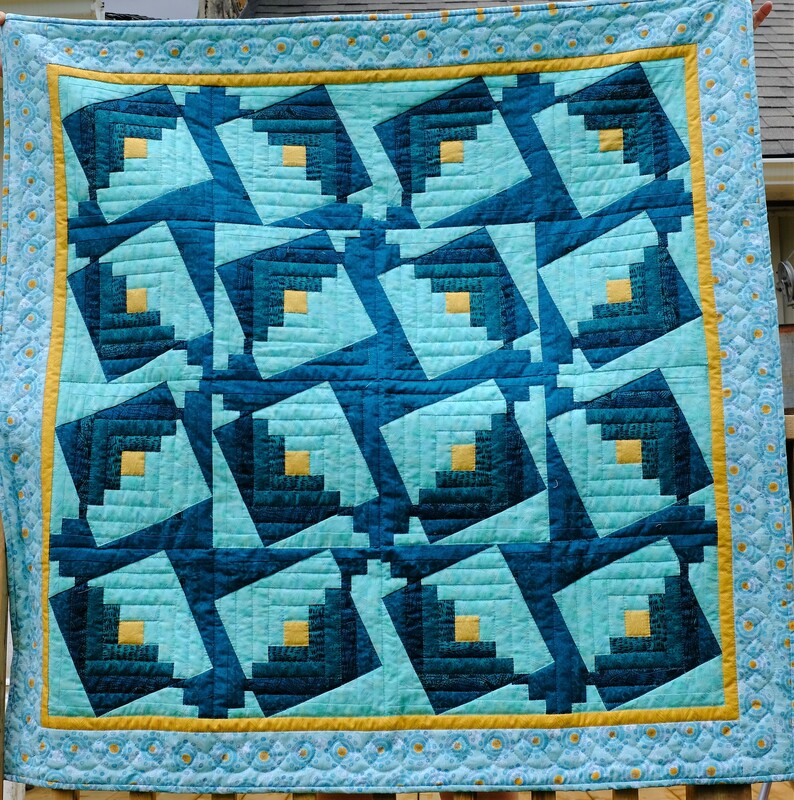 This pieced crib quilt’s design is “Flags and Ships”. It measures 47.5″ x 59″. 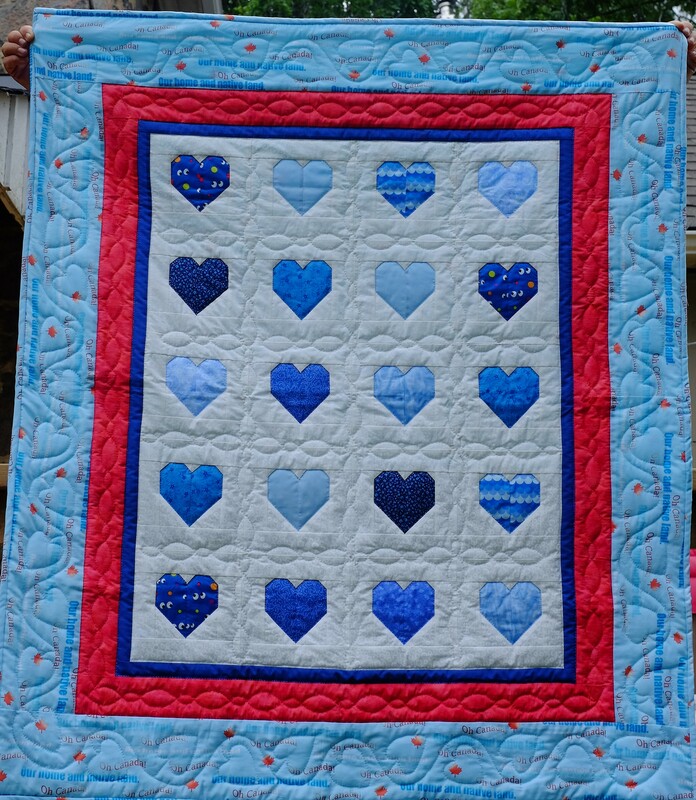 Quilt #21 is another crib quilt, called “Heart of Canada”. It’s 45.5″ x 52″. 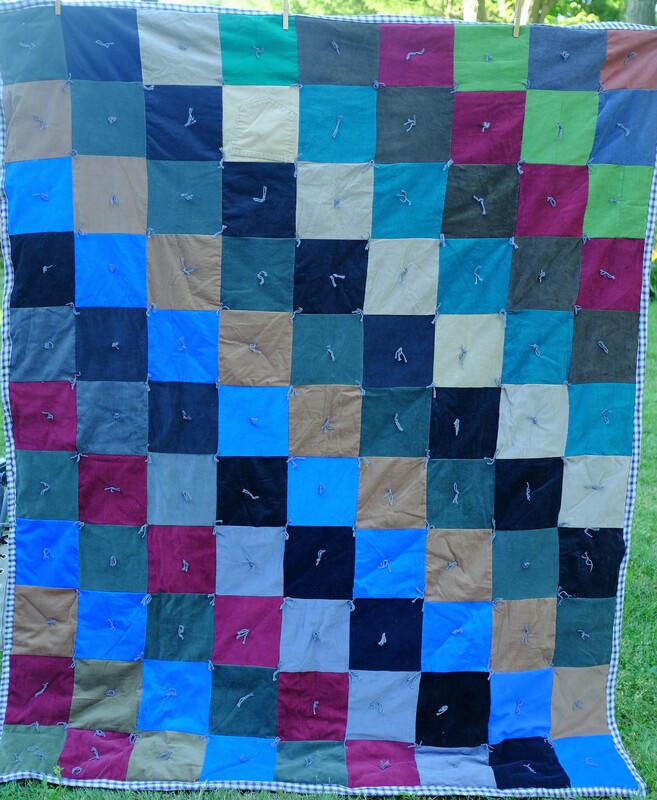 Here is a “Crib of Many Colours” crib quilt, sized 43″ x 50″. 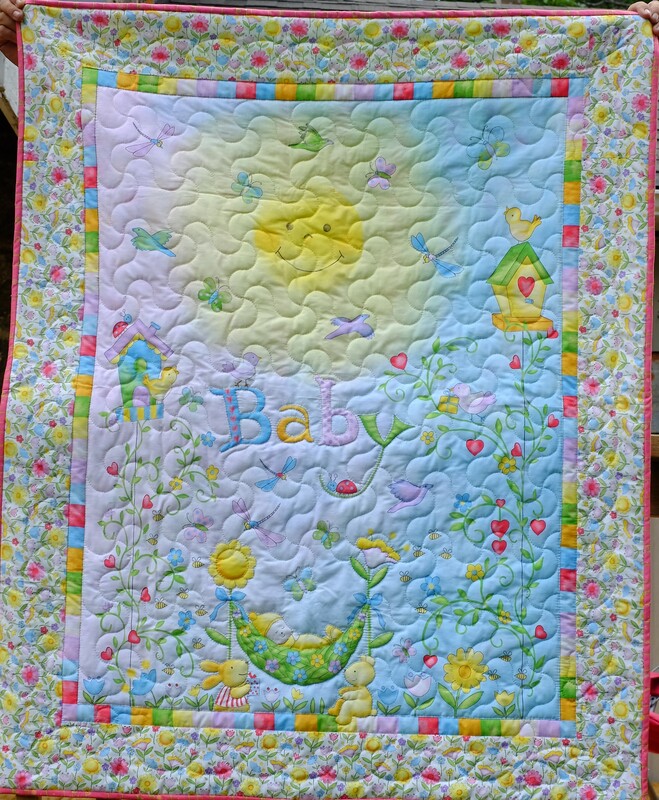 Rounding out this selection of crib quilts is a “Sunshine Baby” design, which is 42″ x 53″. On August 27, we added three more crib quilts. The first is a hand quilted “Jungle” design made of printed material. It measures 30″ x 43″. This “Hoot, Hoot Hurray” crib quilt is 36″ x 51″. It’s also hand quilted and made of printed material. This machine quilted “Artic Playground” crib quilt is made of prewashed cotton batting and printed material. The size is 34″ x 37″. We added a few more child-oriented quilts on September 5. This friendly Teddy and Friends design measures 44″ x 34″. It’s a printed material with pieced border. This Giraffe Family design measures 40″ x 49″. It’s also made of printed material with a pieced border. 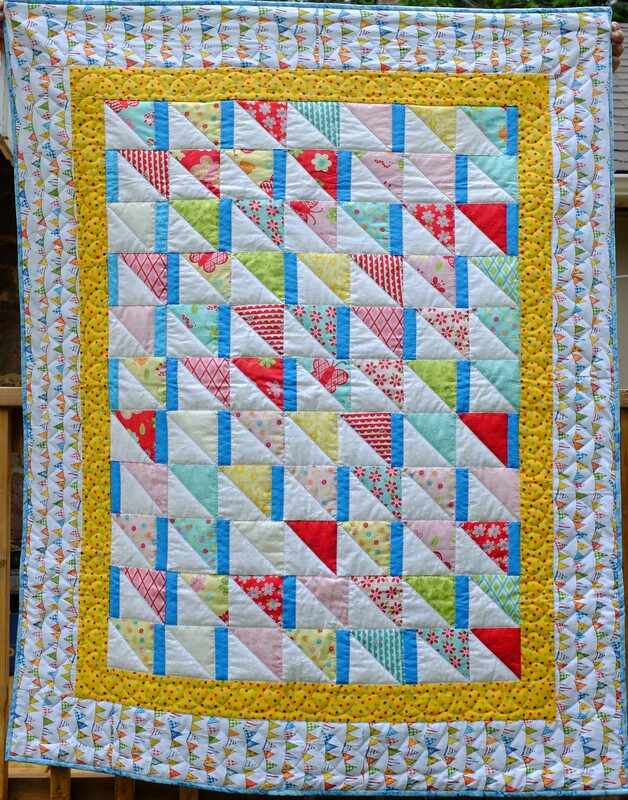 This Two by Two design show’s Noah’s Ark in a 40″ x 53″ crib quilt. 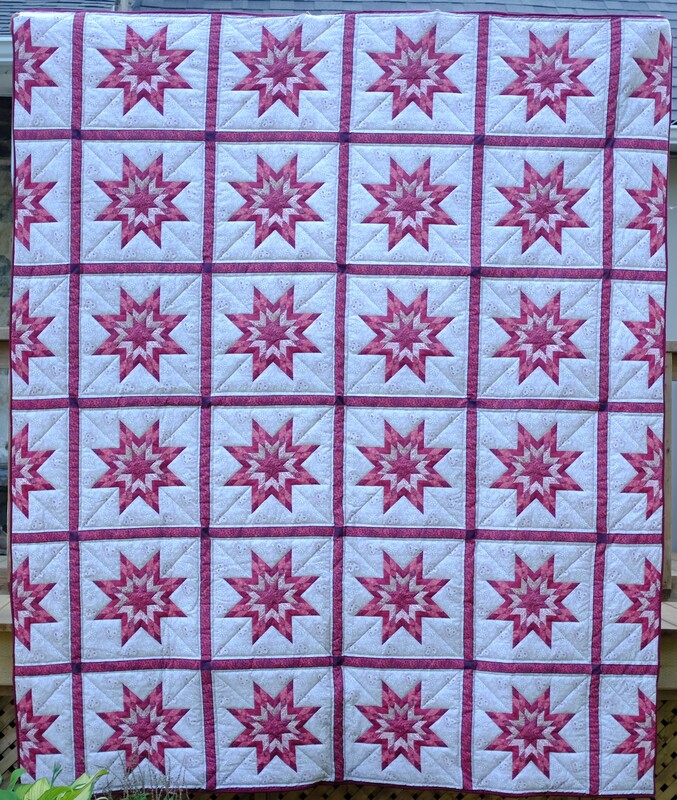 “Dogs and Cats in the Window Box” is a long and appropriate name for this 39″ x 48″ crib quilt. Is this really the end of the crib quilts? Who can say? You could always choose to hang a quilt on the wall rather than using it on a bed. These small and nearly square quilts are especially suited to be wall hangings, but you could use them on cribs instead… or in other seasons! But let’s just call them “wall hangings” for now. This wall hanging is a 51″ x 52″ “Angled Log Cabin” design. This “Corner Stones” wall hanging also measures 51″ x 52″. Added on Sept. 6: a Batik Pineapple wall hanging; not measured. Batik Pineapple wall hanging; not measured. Will there be more wall hangings? This blue Broken Star on a pale background measures 98″ x 107″. This square Falling Leaves pattern is a full 100″ x 100″. Here’s an Uneven 4-Patch design, size 86″ x 102″. This quilt’s title is Trip Around the World. It measures 82″ x 102″. 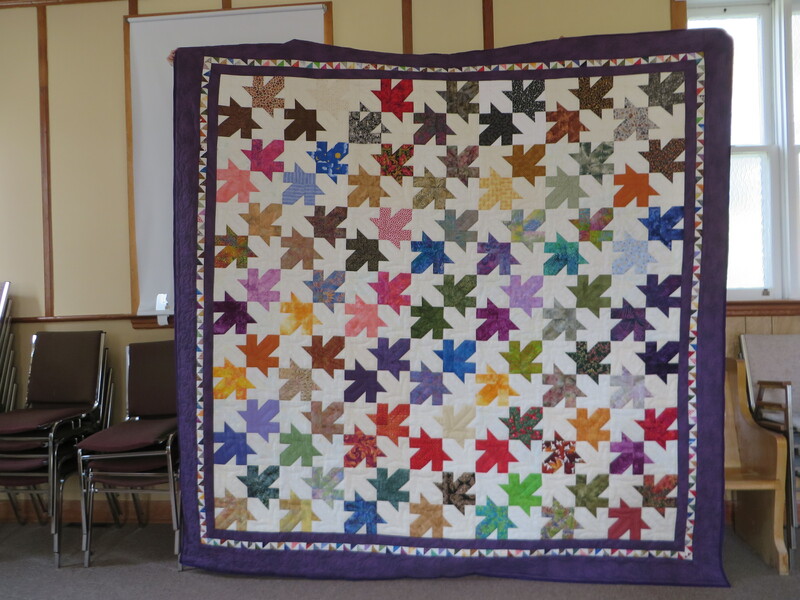 This is a Tree of Hope and Reconciliation quilt; it’s 82″ x 84″. Here’s a Vintage 9 Patch design, size 62″ x 71″. 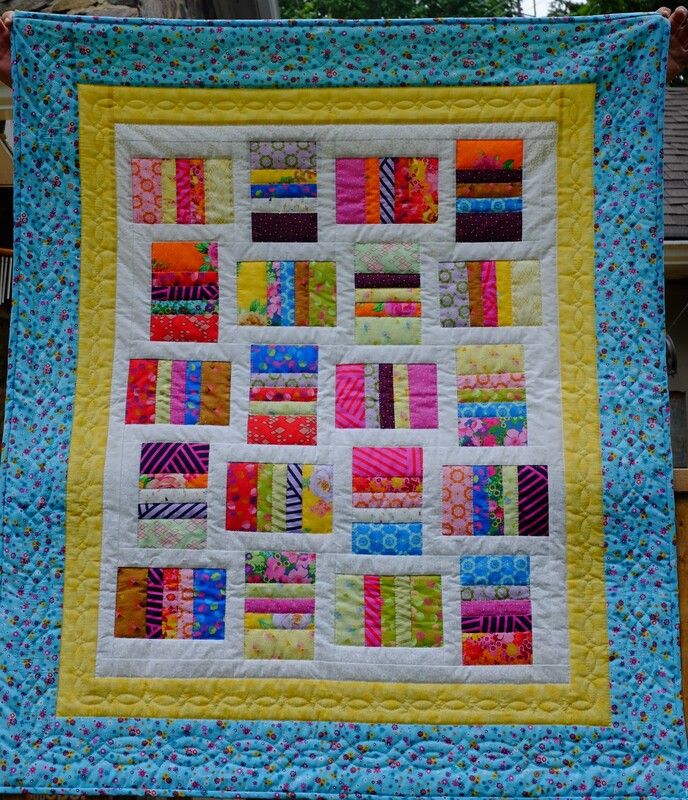 This is a quilted Scrappy Stripes design, measuring 63″ x 70″. Next we have a hand embroidered, whole cloth quilt in an “Embroidered Basket” design. It measures 80″ x 92″ . This design is Harmony Retreat. The quilt is 62″ x 84″. 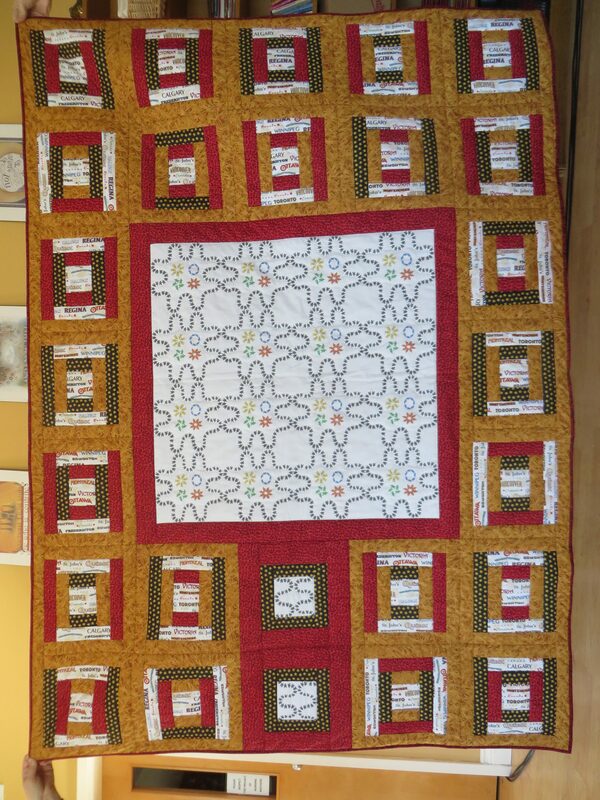 Here is a pieced applique quilt in a “Sunny Dresden” pattern; the size is 84″ x 102″. 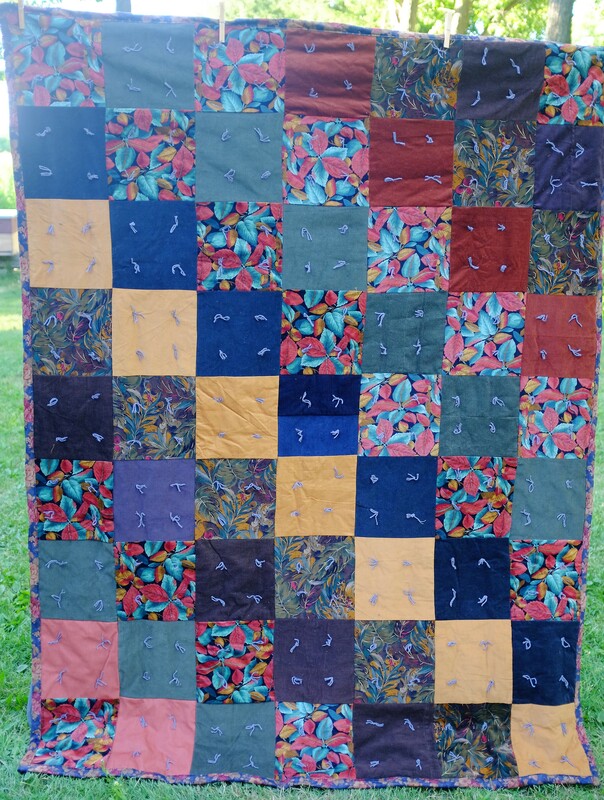 We added more quilts on August 27, including two Brazilian Butterflies. Both are pieced, applique, cotton batting, and machine quilted. The first is 59″ x 58″; the second, 59″ x 59″. More quilts will be on display soon. 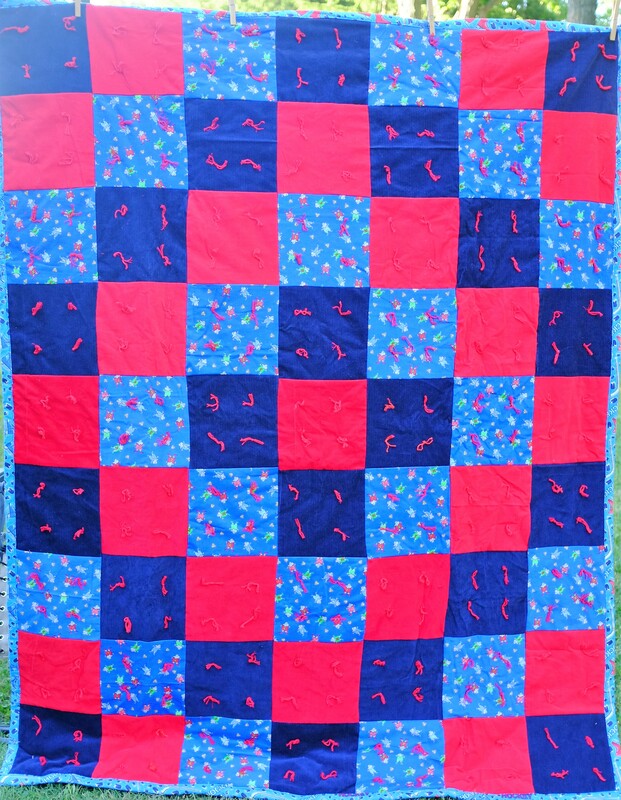 This small 34″ x 37″ quilt is an “Amish Style Churn Dash” design. This 84″ x 98″ is a “Tiles” design. 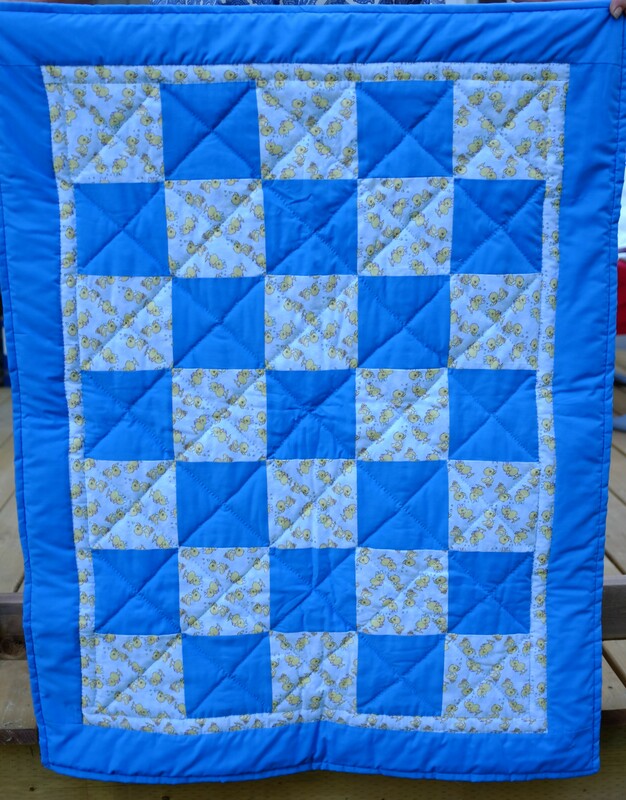 This quilt, in the popular “Log Cabin” design, measures 84″ x 98″. Be sure to tell your guests that they’re admiring a “Disappearing Pinwheel Shoofly”. It’s 71″ x 93″. (Corrected the size on Sept. 5… sorry). 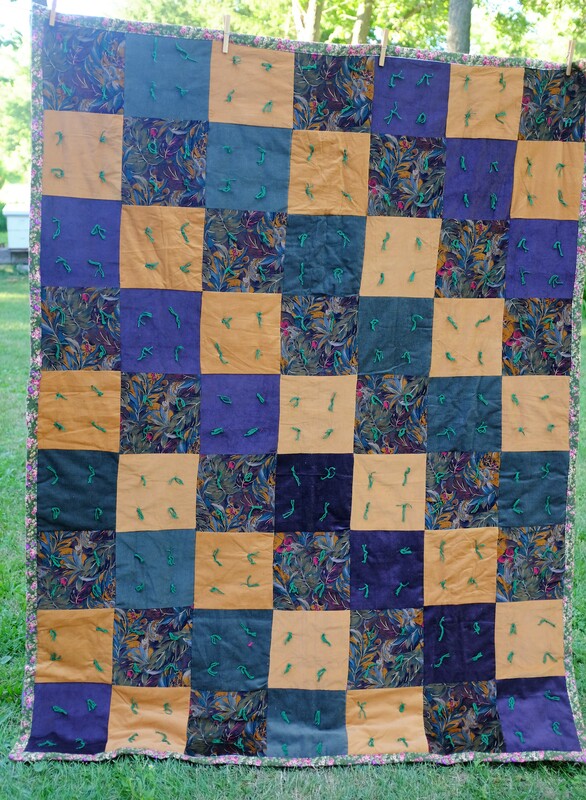 Here is a Green/Print Patchwork quilt, size 78″ x 97″. How deeply can we embed designs? This Square in a Square quilt is 82″ x 98″. 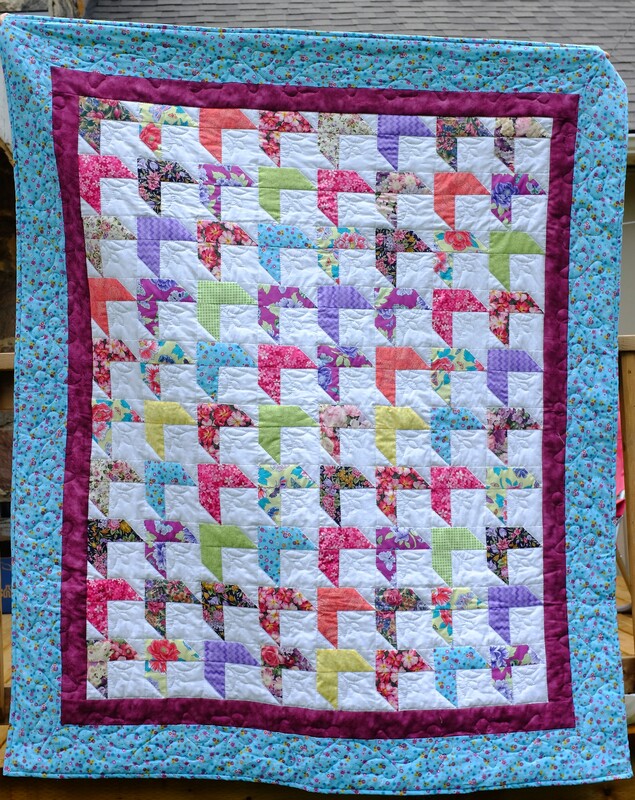 This is a basic Pinwheel quilt, but still quite colourful. The size is 86″ x 112″. 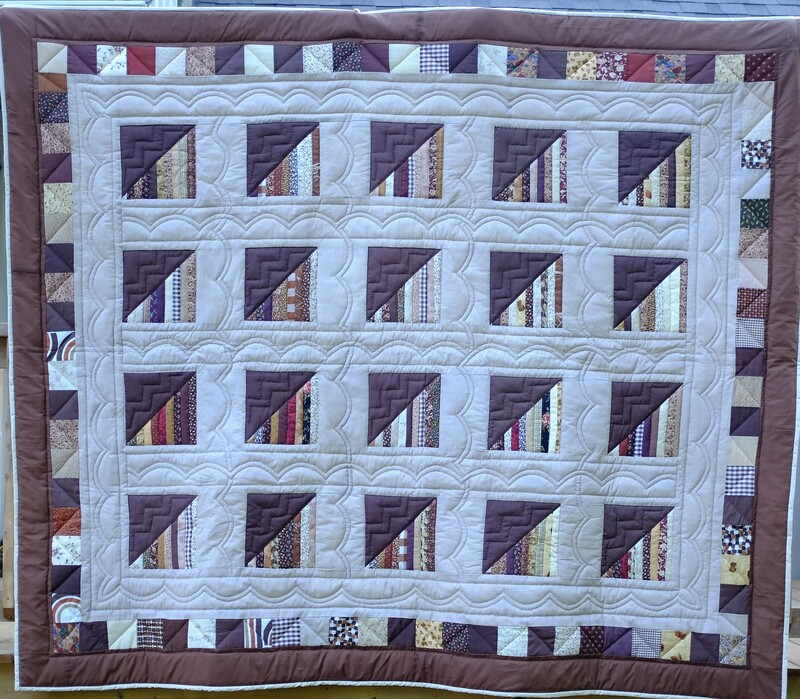 The name, “Sampler Quilt”, doesn’t do justice to the quality and artistry of this machine-quilted 44″ x 57″ item. It’s made of an 80/20 cotton/poly batting. This Map of the World design is machine quilted of printed material, with a hanging sleeve. The filling is probably a cotton/poly batt. Size is 41″ x 35″. This red-hued Christmas Throw is a pieced quilt, size 50″ x 50″. Here is a tied comforter, as a printed panel, named “Cats”. The size is 60″ x 80″. This is another tied comforter, in a Log Cabin design. measuring 59″ x 75″. This “Trip Around The World” tied comforter is 61″ x 82″. Continuing with tied comforters, this “Gold and Yellows” design measures 60″ x 80″. Would you say this pieced and tied comforter is mauve? We’re sure the size is 58″ x 78″. We know this is a multi-coloured tied comforter, and that it’s 62″ x 77″ in size. Here is a striking use of black, in this corduroy tied comforter, with a plaid back. It measures 60″ x 80″. This is a log cabin design in a barn raising setting. The size is 88″ x 107″. Now for something new: a Modern Square quilt; size 90 1/4″ square. 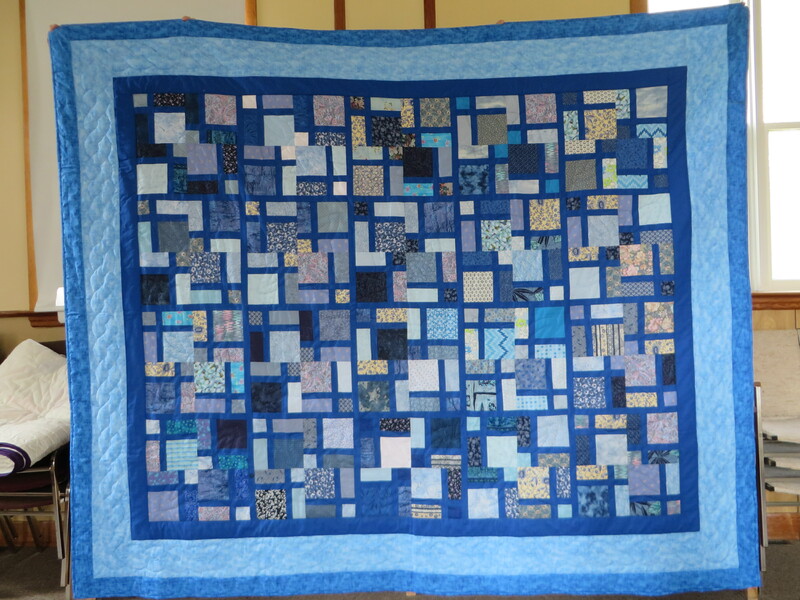 Next up is a blue Mosaic Patchwork quilt, measuring 76″ x 113″. 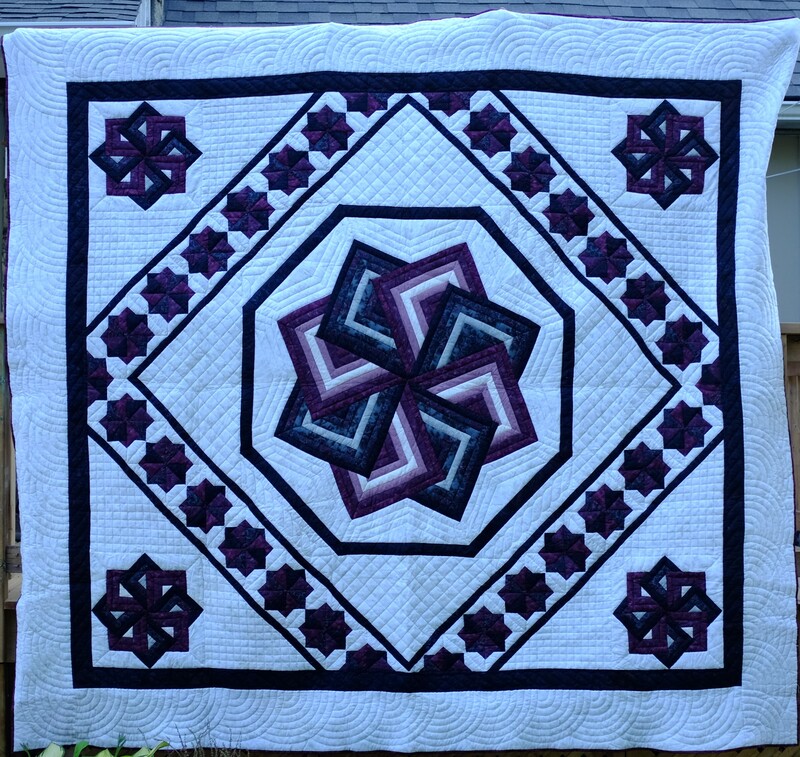 This is a smaller 9 Patch quilt on white, measuring 50″ x 82″. This corduroy comforter is 60″ x 80″. Use this as a throw or as wall hanging. This quilt has a Japanese theme, “Ladies of the Morning”. The size is 44″ x 62.5″. 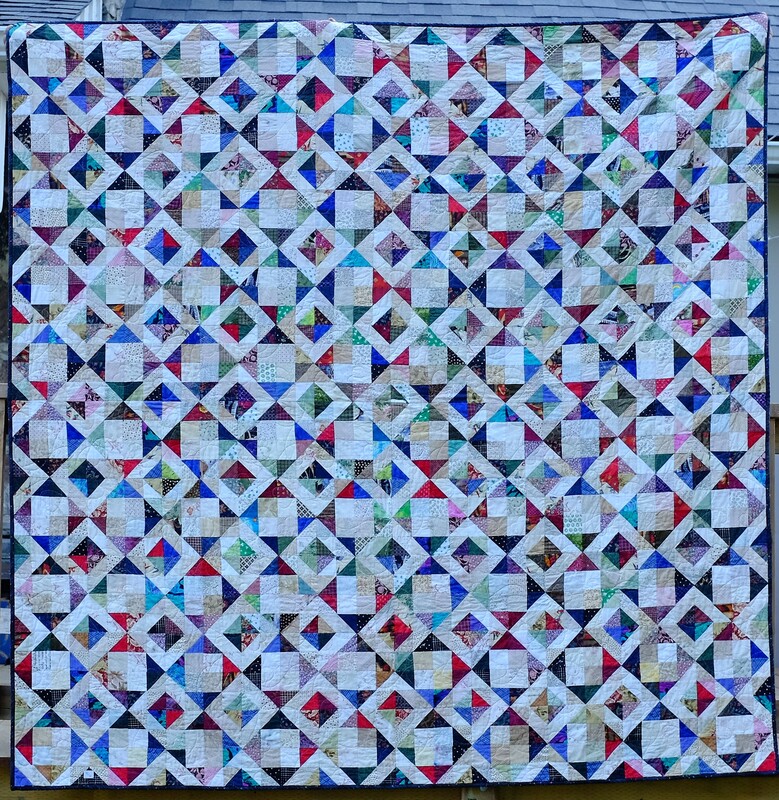 It is reversible to show another pieced backing. This is the reverse side of the above Japanese wall hanging or throw. 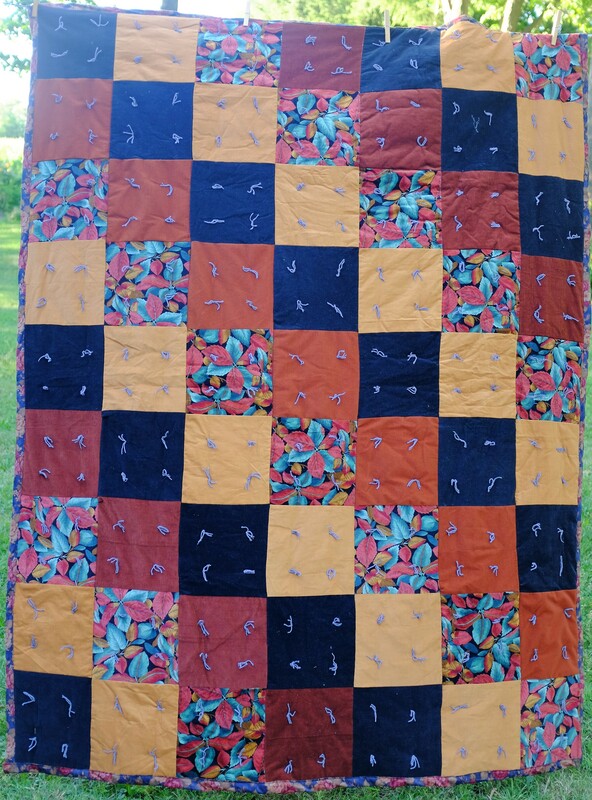 This Split Rail Fence pieced quilt’s colours are rust and orange/brown. It measures 60″ x 80″. 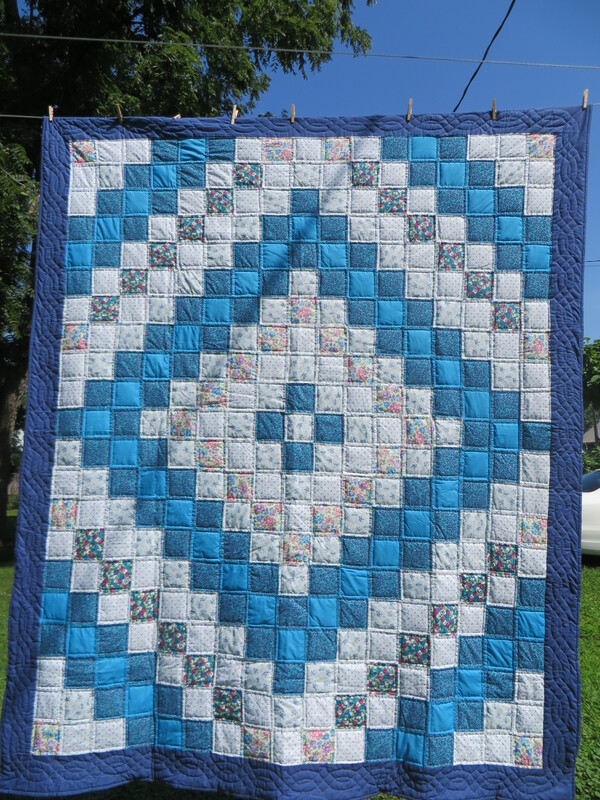 This Sky at Night quilt, in vivid blue tones, gets my vote for “most restful”. It measures 60″ x 61″. This Disappearing 9 Patch design graces a 79″ x 101″ quilt. Here’s a different technique: appliqué. Enjoy these Appliqued Roses in size 94″ x 106″. This square wall hanging, “Pineapple Design”, has 534 pieces. That’s the record for this year, as far as I’ve heard. It’s a square, 43″ x 43″. 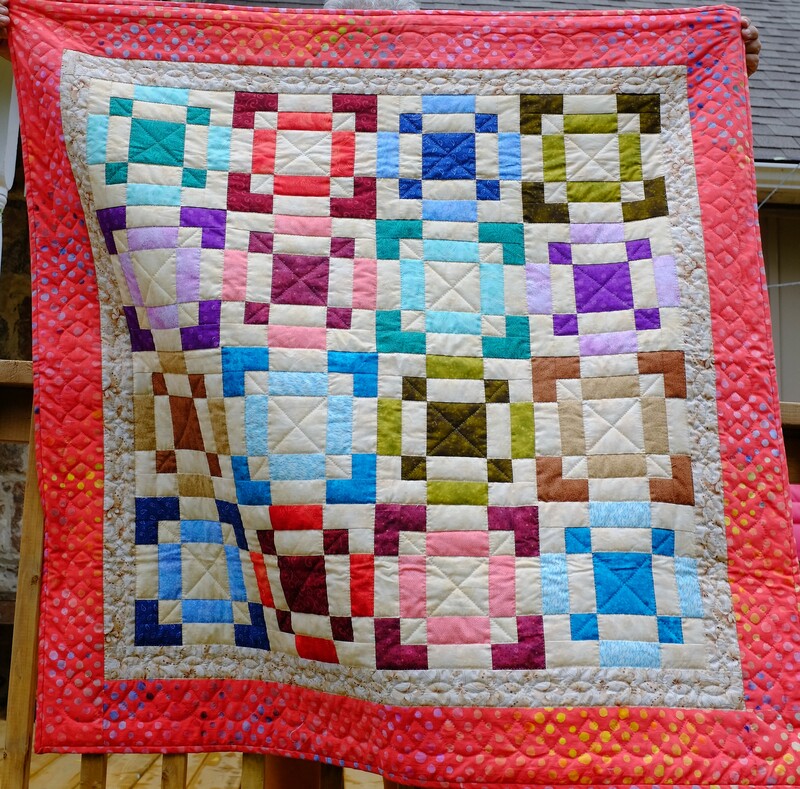 The next quilt is a Modern Squares design. 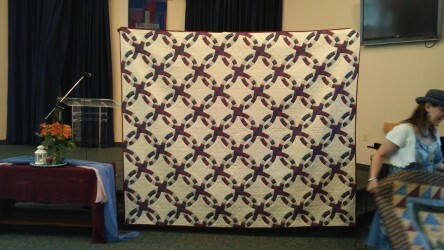 Each individual square was “sponsored” for the MCC “For the Children” fund; now the completed quilt is up for auction. 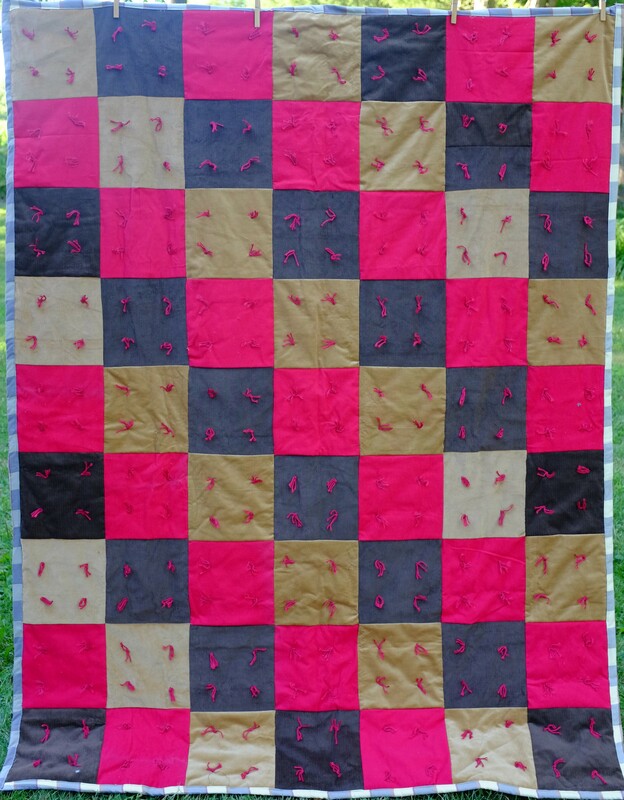 The very final quilt is machine quilted in a Red Barns design. It’s “hot off the press”… well, hot off the needles because it was just finished late this week. 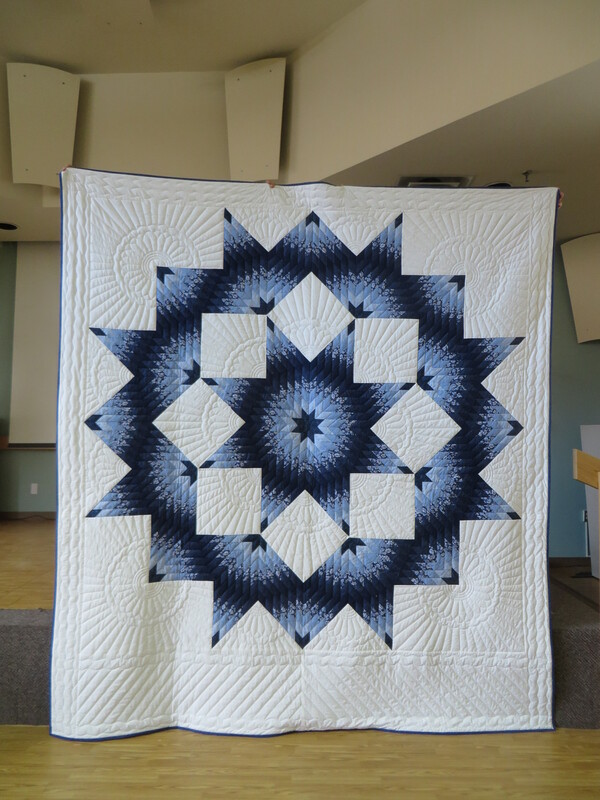 Just in time for the Toronto Mennonite Festival’s quilt auction on Sat. Sept. 15 at high noon. That’s truly it for this page for 2018. Remember the 2017 Quilt Auction? In 2017, dedicated quilters created the special Anniversary Quilt. To revisit the quilts we promoted last year, just click on this Quilts of 2017 link. See you at Black Creek Pioneer Village on Saturday September 15, 2018! Please give the date telling when you will be posting pictures of the quilts to be auctioned off. Also, dimensions of each quilt would be helpful. Thank you. Hi Erin: We are working on this. Thanks for your patience.